I found it! 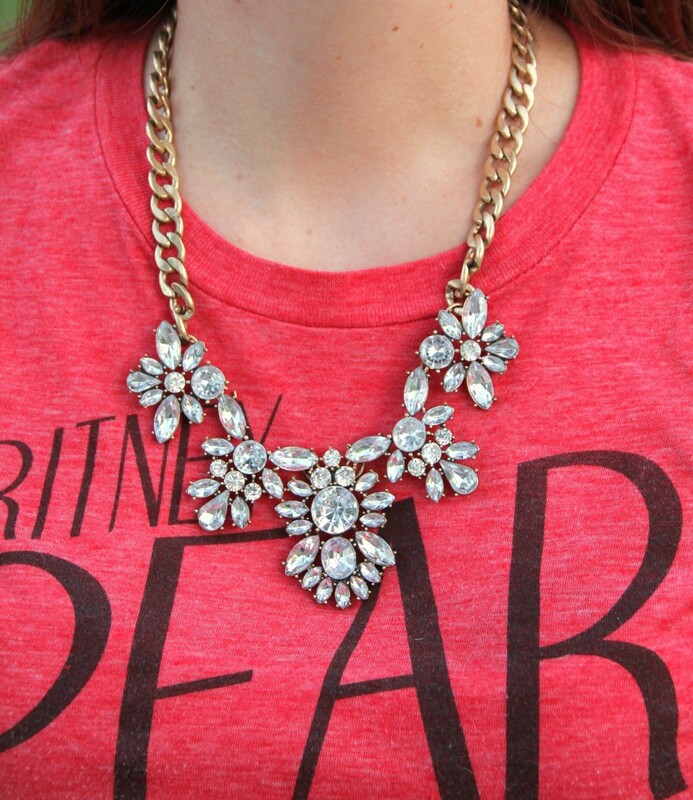 The perfect statement necklace and it was under $30! I have been looking for just the right one since I received a similar one in my Rocksbox. I wanted one with a bit smaller stones than that one. I also wanted something affordable, because statement jewelry is just not going to get as much wear as my everyday pieces. During my search, I found Happiness Boutique. They have tons of fun statement jewelry at affordable prices including some really cute pendant and statement necklaces and statement earrings. I love jewelry with a vintage feel and have quite the wish list on their site! They also have fun vintage inspired clothes. Even better they offer FREE shipping with no minimum purchase price!! They also have a pretty cool Rewards Program. Most sites will offer you points per purchase, but Happiness Boutique goes one step further. They will offer you points for reviewing the jewelry you purchased on their site, sharing photos of your jewelry in action on social media with their hashtag, and sharing your purchase on social media right after you order. Once you have racked up some points, you can redeem for free jewelry and clothes, and some other fun goodies. I love how this necklace has three different designs, but they all work beautifully together. I love wearing necklaces like this underneath button down shirts to let them shine through, but I also love to use a statement necklace to pump up a casual look. 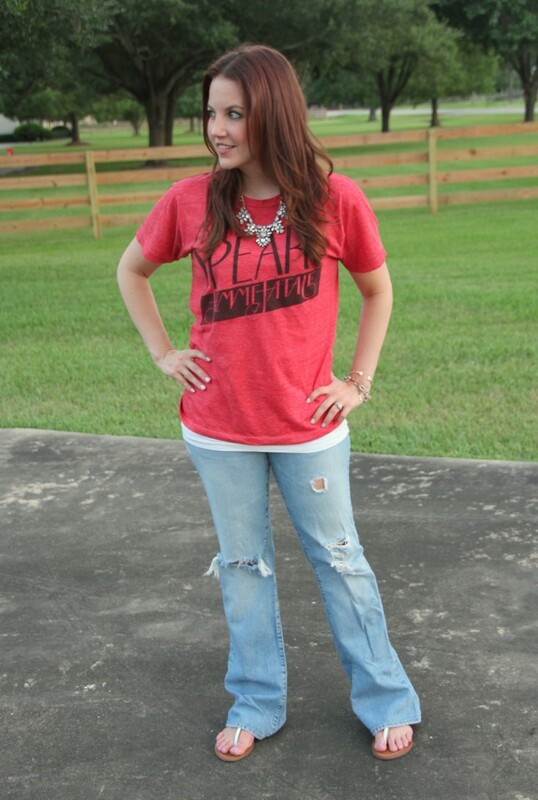 When I am going super laid back casual, I often opt for a vintage tee, distressed jeans, and sandals. I love this Britney tee I purchased at her Femme Fatale concert a few years back. I linked some other vintage style concert tees I found online. 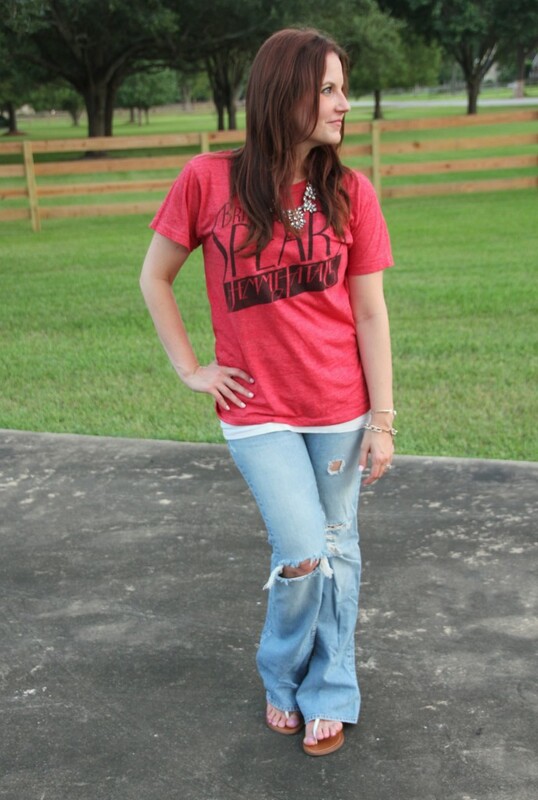 I’ve talked about my love for Lucky Brand jeans before, and this pair is one of my favorites. This is like the second or third pair I ever purchased from them. They are around 10 years old and are still in great condition!! Since they are so old, I linked some other pairs that are a similar distressed and flared look. 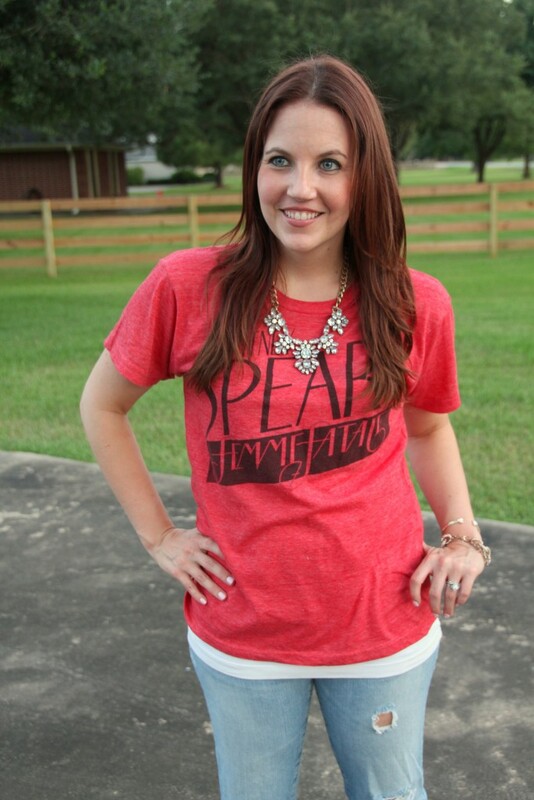 I do not often wear a tee and jeans, so when I do I love being able to dress it up and put a little of glitz and glam into the look! 7 Responses to Hello Happiness! Great color on you…thanks for sharing with the Thursday Blog Hop! 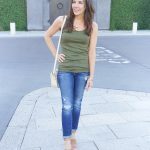 I have seen a lot of bloggers lately sharing their finds from Happines Boutique and they seem to have a great selection of jewelry at great prices. Your necklace is no exception! I love your outfit, and especially your necklace! I just checked out the Happiness Boutique and now I want everything too! 🙂 Stopping by from the WIWW link-up! This is seriously my wardrobe goal. 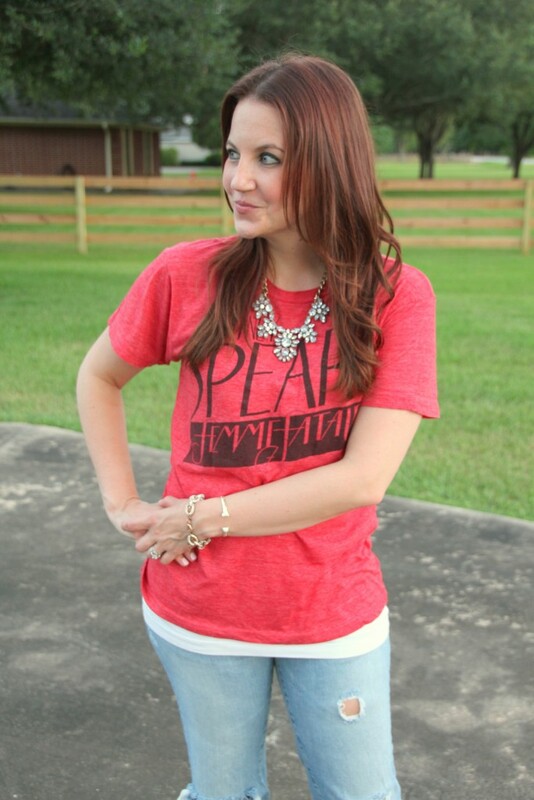 I love a distressed jean and concert tee paired with something like that necklace. LOVE, love, love! I’ll need to check out Lucky jeans. I’ve been having the hardest time finding a jean I love. My last favorites were from the Gap and they just completely fell apart. 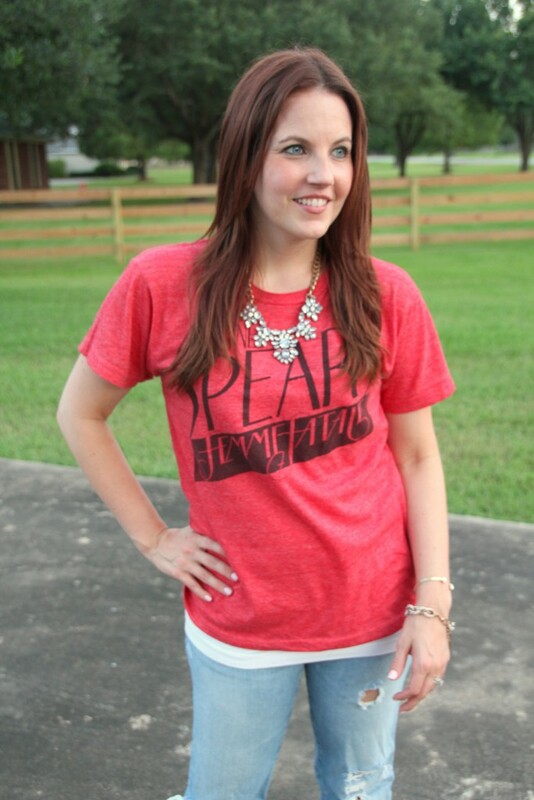 I love the “dressy” crystal necklace with a more casual tee. Such a great vibe! Love the nail color on your toes!